Pumila Spruce is a dwarf evergreen conifer that is a neatly rounded shrub. It has short, bright green needles that are soft to the touch and will hold their color through the winter. It will grow to a height of 3' to 4' tall and 3' to 6' wide. 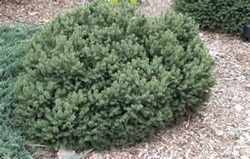 Use this shrub as a foundation plant, in a rock garden, as an accent, or a grouping in a landscape bed. Pumila Spruce is deer resistant. Protect from hot summer sun by planting in an area where there is shade in that part of the day.